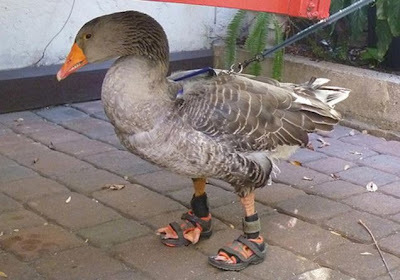 Gator the rescue goose’s adoptive parents, Bob and Lauree Strouse, were so concerned his feet would suffer on their walks, they got him a pair of sandals. The couple designed the footwear to combat the hot and harsh concrete in the town of St Augustine, Florida. The trio have become a regular sight since finding Gator wandering along the edge of Lake Roy in Winter Haven, Florida. They feared its resident alligators would gobble him up, so took him under their wing. ‘We rescued him,’ said Mrs Strouse. They called him Gator because it’s a shortening of the rather pessimistic ‘Gator bait’. That was four years ago. 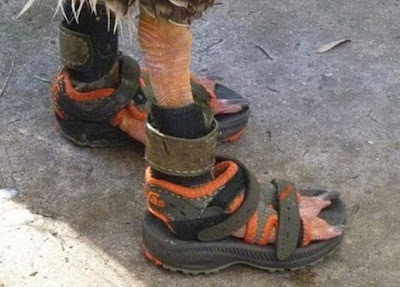 0 responses to "The goose who wears a pair of sandals"